Frederick was the second son of Philip and Dinah Merriman, who had six other children: William Edward, born 1861, Lucy b. 1864, Sarah b. 1866, Keziah b. 1869, John b. 1875 and Lily b. 1878. 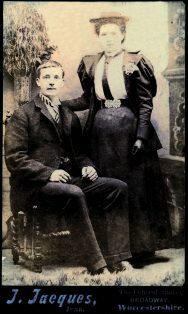 On their marriage in August 1860, Philip and Dinah moved in with her father, William Waine, in the end cottage of Box Hedge Row (now Royal Oak Terrace) Sheep Street. He died in July 1862 and they continued to rent the cottage. Little is known of Fred’s childhood, but we are fortunate that some formal family photographs were taken, unusual at this time for poor families. In the 1891 census Fred, aged 18, was listed as an agricultural labourer, like his father who also had a skills as a sawyer and tree feller. 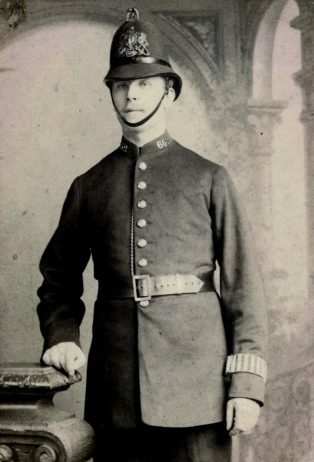 Fred Merriman joined the City of London Police on 9th January 1896. He was aged 22 years and 8 months, and was single at the time. He was posted to Division A (Moor Lane) and given Warrant Number 6701 and Collar Number 230. He married Charlotte (Lottie) Henrietta Gibbs in Islington in 1902. In the 1911 census the couple were living at 42 New Charles Street, conveniently situated for his work. They had no children. He ended his career, still a constable, on 13th January 1921, with a pension of £153 13s. 5d. per annum. The records state that he was ‘permitted to retire’, no reason given, but he had served just 25 years so it is likely that he chose to take his pension. The tug of war was contested as a team event in the Summer Olympics at every Olympiad from 1900 to 1920. Originally the competition was entered by clubs, which meant that one country could win several medals. This happened in 1904, when the United States won all three medals, and in 1908 when the podium was occupied by three British teams. 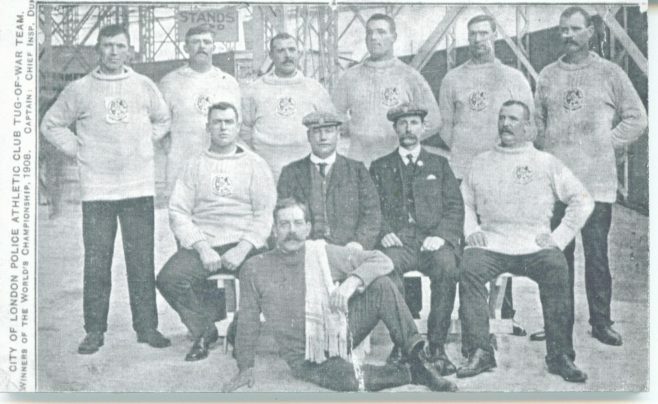 Fred belonged to the City of London Police team, who defeated Liverpool Police in the final, winning the first two pulls. MERRIMAN, Frederick: Frederick was born in Gloucestershire. Like his father, he became a tree feller – good training, perhaps, for his chosen sport. He joined the City Police in 1896, aged 22 years, and was recorded as being 5 feet and 11 inches tall. Frederick was one of a number of the tug-of-war team to receive a Commendation for skilled first aid, and to end his service at Moor Lane. He retired on pension in 1921 and died aged 67 years in 1940. He had not been here long before he and some of the Hathaway family, with Fred Taylor, formed an orchestra. 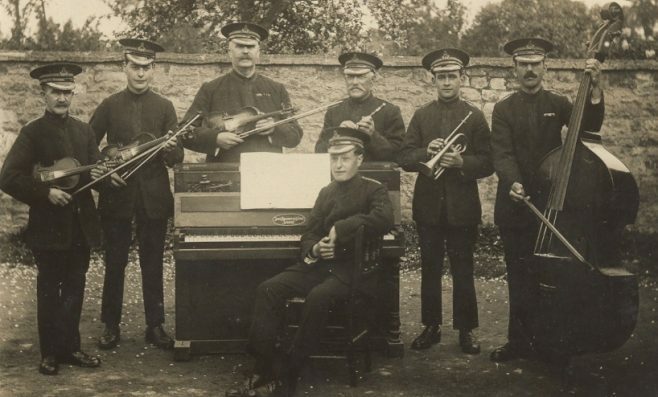 They called themselves ‘The Bijou Orchestra’. For quite a number of years they were very popular at dances throughout the district. One evening each week they used to hold their band practice in the Infant School. It was quite usual to see a gathering of people outside on the pavement listening.